Hypoxia-inducible factors (HIFs) are transcription factors that respond to decreases in available oxygen in the cellular environment, or hypoxia. Structure of a HIF-1a-pVHL-ElonginB-ElonginC Complex. Structure of hypoxia-inducible factor-1 alpha subunit. The HIF signaling cascade mediates the effects of hypoxia, the state of low oxygen concentration, on the cell. Hypoxia often keeps cells from differentiating. However, hypoxia promotes the formation of blood vessels, and is important for the formation of a vascular system in embryos, and cancer tumors. The hypoxia in wounds also promotes the migration of keratinocytes and the restoration of the epithelium. In general, HIFs are vital to development. In mammals, deletion of the HIF-1 genes results in perinatal death. HIF-1 has been shown to be vital to chondrocyte survival, allowing the cells to adapt to low-oxygen conditions within the growth plates of bones. HIF plays a central role in the regulation of human metabolism. The alpha subunits of HIF are hydroxylated at conserved proline residues by HIF prolyl-hydroxylases, allowing their recognition and ubiquitination by the VHL E3 ubiquitin ligase, which labels them for rapid degradation by the proteasome. This occurs only in normoxic conditions. In hypoxic conditions, HIF prolyl-hydroxylase is inhibited, since it utilizes oxygen as a cosubstrate. Inhibition of electron transfer in the succinate dehydrogenase complex due to mutations in the SDHB or SDHD genes can cause a build-up of succinate that inhibits HIF prolyl-hydroxylase, stabilizing HIF-1α. This is termed pseudohypoxia. HIF-1, when stabilized by hypoxic conditions, upregulates several genes to promote survival in low-oxygen conditions. These include glycolysis enzymes, which allow ATP synthesis in an oxygen-independent manner, and vascular endothelial growth factor (VEGF), which promotes angiogenesis. HIF-1 acts by binding to HIF-responsive elements (HREs) in promoters that contain the sequence NCGTG (where N is either A or G). It has been shown that muscle A kinase–anchoring protein (mAKAP) organized E3 ubiquitin ligases, affecting stability and positioning of HIF-1 inside its action site in the nucleus. Depletion of mAKAP or disruption of its targeting to the perinuclear (in cardiomyocytes) region altered the stability of HIF-1 and transcriptional activation of genes associated with hypoxia. Thus, "compartmentalization" of oxygen-sensitive signaling components may influence the hypoxic response. The advanced knowledge of the molecular regulatory mechanisms of HIF1 activity under hypoxic conditions contrast sharply with the paucity of information on the mechanistic and functional aspects governing NF-κB-mediated HIF1 regulation under normoxic conditions. However, HIF-1α stabilization is also found in non-hypoxic conditions through an, until recently, unknown mechanism. It was shown that NF-κB (nuclear factor κB) is a direct modulator of HIF-1α expression in the presence of normal oxygen pressure. siRNA (small interfering RNA) studies for individual NF-κB members revealed differential effects on HIF-1α mRNA levels, indicating that NF-κB can regulate basal HIF-1α expression. Finally, it was shown that, when endogenous NF-κB is induced by TNFα (tumour necrosis factor α) treatment, HIF-1α levels also change in an NF-κB-dependent manner. HIF-1 and HIF-2 have different physiological roles. HIF-2 regulates erythropoietin production in adult life. In normal circumstances after injury HIF-1a is degraded by prolyl hydroxylases (PHDs). In June 2015, scientists found that the continued up-regulation of HIF-1a via PHD inhibitors regenerates lost or damaged tissue in mammals that have a repair response; and the continued down-regulation of Hif-1a results in healing with a scarring response in mammals with a previous regenerative response to the loss of tissue. The act of regulating HIF-1a can either turn off, or turn on the key process of mammalian regeneration. 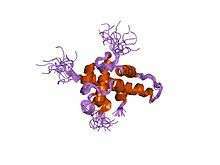 Recently, several drugs that act as selective HIF prolyl-hydroxylase inhibitors have been developed. The most notable of these include FibroGen's compounds FG-2216 and FG-4592, both of which intended as orally acting drugs for use in the treatment of forms of anemia. By inhibiting HIF prolyl-hydroxylase, the stability of HIF-2α in the kidney is increased, which results in an increase in endogenous production of erythropoietin. Both of these drugs made it through to phase II clinical trials, but these were suspended temporarily in May 2007 following the death of a trial participant from fulminant hepatitis. However, it is unclear whether this death was caused by FG-2216. The hold has been lifted in early 2008, as FDA has reviewed and approved a thorough response from FibroGen. In other scenarios and in contrast to the therapy outlined above, recent research suggests that HIF induction in normoxia is likely to have serious consequences in disease settings with a chronic inflammatory component. It has also been shown that chronic inflammation is self-perpetuating and that it distorts the microenvironment as a result of aberrantly active transcription factors. As a consequence, alterations in growth factor, chemokine, cytokine, and ROS balance occur within the cellular milieu that in turn provide the axis of growth and survival needed for de novo development of cancer and metastasis. The results of a recently published study have numerous implications for a number of pathologies where NF-κB and HIF-1 are deregulated, including rheumatoid arthritis and cancer. Therefore, it is thought that understanding the cross-talk between these two key transcription factors, NF-κB and HIF, will greatly enhance the process of drug development. HIF activity is involved in angiogenesis required for cancer tumor growth, so HIF inhibitors such as phenethyl isothiocyanate and Acriflavine are (since 2006) under investigation for anti-cancer effects. Research conducted on mice suggests that stabilizing HIF using an HIF prolyl-hydroxylase inhibitor enhances hippocampal memory, likely by increasing erythropoietin expression. ↑ Smith TG, Robbins PA, Ratcliffe PJ (May 2008). "The human side of hypoxia-inducible factor". Br. J. Haematol. 141 (3): 325–34. doi:10.1111/j.1365-2141.2008.07029.x. PMC 2408651 . PMID 18410568. ↑ Wilkins, Sarah E.; Abboud, Martine I.; Hancock, Rebecca L.; Schofield, Christopher J. (2016-04-19). "Targeting Protein–Protein Interactions in the HIF System". ChemMedChem. 11 (8): 773–786. doi:10.1002/cmdc.201600012. ISSN 1860-7187. PMC 4848768 . PMID 26997519. ↑ Wang GL, Jiang BH, Rue EA, Semenza GL (June 1995). "Hypoxia-inducible factor 1 is a basic helix-loop-helix-PAS heterodimer regulated by cellular O2 tension". Proc. Natl. Acad. Sci. U.S.A. 92 (12): 5510–4. doi:10.1073/pnas.92.12.5510. PMC 41725 . PMID 7539918. ↑ Jiang BH, Rue E, Wang GL, Roe R, Semenza GL (July 1996). "Dimerization, DNA binding, and transactivation properties of hypoxia-inducible factor 1". J. Biol. Chem. 271 (30): 17771–8. doi:10.1074/jbc.271.30.17771. PMID 8663540. ↑ Zhulin IB, Taylor BL, Dixon R (September 1997). "PAS domain S-boxes in Archaea, Bacteria and sensors for oxygen and redox". Trends Biochem. Sci. 22 (9): 331–3. doi:10.1016/S0968-0004(97)01110-9. PMID 9301332. ↑ Ponting CP, Aravind L (November 1997). "PAS: a multifunctional domain family comes to light". Curr. Biol. 7 (11): R674–7. doi:10.1016/S0960-9822(06)00352-6. PMID 9382818. ↑ Yang J, Zhang L, Erbel PJ, Gardner KH, Ding K, Garcia JA, Bruick RK (October 2005). "Functions of the Per/ARNT/Sim domains of the hypoxia-inducible factor". J. Biol. Chem. 280 (43): 36047–54. doi:10.1074/jbc.M501755200. PMID 16129688. ↑ Min JH, Yang H, Ivan M, Gertler F, Kaelin WG, Pavletich NP (June 2002). "Structure of an HIF-1alpha -pVHL complex: hydroxyproline recognition in signaling". Science. 296 (5574): 1886–9. doi:10.1126/science.1073440. PMID 12004076. ↑ Freedman SJ, Sun ZY, Poy F, et al. (April 2002). "Structural basis for recruitment of CBP/p300 by hypoxia-inducible factor-1 alpha". Proc. Natl. Acad. Sci. U.S.A. 99 (8): 5367–72. doi:10.1073/pnas.082117899. PMC 122775 . PMID 11959990. ↑ Benizri E, Ginouvès A, Berra E (April 2008). "The magic of the hypoxia-signaling cascade". Cell. Mol. Life Sci. 65 (7-8): 1133–49. doi:10.1007/s00018-008-7472-0. PMID 18202826. ↑ Formenti F, Constantin-Teodosiu D, Emmanuel Y, Cheeseman J, Dorrington KL, Edwards LM, Humphreys SM, Lappin TR, McMullin MF, McNamara CJ, Mills W, Murphy JA, O'Connor DF, Percy MJ, Ratcliffe PJ, Smith TG, Treacy M, Frayn KN, Greenhaff PL, Karpe F, Clarke K, Robbins PA (July 2010). "Regulation of human metabolism by hypoxia-inducible factor". Proc. Natl. Acad. Sci. U.S.A. 107 (28): 12722–7. doi:10.1073/pnas.1002339107. PMC 2906567 . PMID 20616028. ↑ Maxwell PH, Wiesener MS, Chang GW, Clifford SC, Vaux EC, Cockman ME, Wykoff CC, Pugh CW, Maher ER, Ratcliffe PJ (May 1999). "The tumour suppressor protein VHL targets hypoxia-inducible factors for oxygen-dependent proteolysis". Nature. 399 (6733): 271–5. doi:10.1038/20459. PMID 10353251. ↑ Semenza GL (August 2004). "Hydroxylation of HIF-1: oxygen sensing at the molecular level". Physiology (Bethesda). 19 (4): 176–82. doi:10.1152/physiol.00001.2004. PMID 15304631. ↑ Wong W, Goehring AS, Kapiloff MS, Langeberg LK, Scott JD (2008). "mAKAP compartmentalizes oxygen-dependent control of HIF-1alpha". Sci Signal. 1 (51): ra18. doi:10.1126/scisignal.2000026. PMC 2828263 . PMID 19109240. 1 2 van Uden P, Kenneth NS, Rocha S (2008). "Regulation of hypoxia-inducible factor-1alpha by NF-kappaB". Biochem J. 412 (3): 477–484. doi:10.1042/BJ20080476. PMC 2474706 . PMID 18393939. ↑ Haase VH (July 2010). "Hypoxic regulation of erythropoiesis and iron metabolism". Am. J. Physiol. Renal Physiol. 299 (1): F1–13. doi:10.1152/ajprenal.00174.2010. PMC 2904169 . PMID 20444740. ↑ eurekalert.org staff (3 June 2015). "Scientist at LIMR leads study demonstrating drug-induced tissue regeneration". eurekalert.org. Lankenau Institute for Medical Research (LIMR),. Retrieved 3 July 2015. ↑ Zhang Y, Strehin I, Bedelbaeva K, Gourevitch D, Clark L, Leferovich J, Messersmith PB, Heber-Katz E. Drug-induced regeneration in adult mice. Sci Transl Med. 2015;290. ↑ Bruegge K, Jelkmann W, Metzen E (2007). "Hydroxylation of hypoxia-inducible transcription factors and chemical compounds targeting the HIF-alpha hydroxylases". Curr. Med. Chem. 14 (17): 1853–62. doi:10.2174/092986707781058850. PMID 17627521. ↑ Cases A (December 2007). "The latest advances in kidney diseases and related disorders". Drug news & perspectives. 20 (10): 647–54. ISSN 0214-0934. PMID 18301799. ↑ Hsieh MM, Linde NS, Wynter A, Metzger M, Wong C, Langsetmo I, Lin A, Smith R, Rodgers GP, Donahue RE, Klaus SJ, Tisdale JF (September 2007). "HIF prolyl hydroxylase inhibition results in endogenous erythropoietin induction, erythrocytosis, and modest fetal hemoglobin expression in rhesus macaques". Blood. 110 (6): 2140–7. doi:10.1182/blood-2007-02-073254. PMC 1976368 . PMID 17557894. ↑ Lee, K.; Zhang, H.; Qian, D. Z.; Rey, S.; Liu, J. O.; Semenza, G. L. (2009). "Acriflavine inhibits HIF-1 dimerization, tumor growth, and vascularization". Proceedings of the National Academy of Sciences. 106 (42): 17910. doi:10.1073/pnas.0909353106. ↑ Syed Alwi SS, Cavell BE, Telang U, Morris ME, Parry BM, Packham G (November 2010). "In vivo modulation of 4E binding protein 1 (4E-BP1) phosphorylation by watercress: a pilot study". Br. J. Nutr. 104 (9): 1288–96. doi:10.1017/S0007114510002217. PMID 20546646. ↑ Semenza GL (October 2007). "Evaluation of HIF-1 inhibitors as anticancer agents". Drug Discov. Today. 12 (19-20): 853–9. doi:10.1016/j.drudis.2007.08.006. PMID 17933687. ↑ Melillo G (September 2006). "Inhibiting hypoxia-inducible factor 1 for cancer therapy". Mol. Cancer Res. 4 (9): 601–5. doi:10.1158/1541-7786.MCR-06-0235. PMID 16940159. ↑ Adamcio, B.; Sperling, S.; Hagemeyer, N.; Walkinshaw, G.; Ehrenreich, H. (2010). "Hypoxia inducible factor stabilization leads to lasting improvement of hippocampal memory in healthy mice". Behavioural Brain Research. 208 (1): 80–84. doi:10.1016/j.bbr.2009.11.010. PMID 19900484.